Body jewellery add ons, top jewels, spare screw on balls, plain surgical steel bars for belly bars etc. All of these jewelled balls have 1.6mm threads and will screw onto any of our 1.6mm body jewellery, including belly bars & tongue bars. Body jewellery add ons, spare top balls for belly bars, spare balls for tongue bars, jewelled screw on balls. 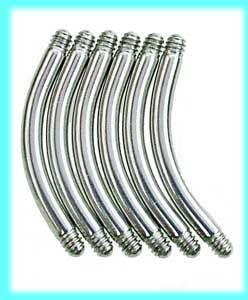 6mm belly bars, plain high grade 316L surgical steel 6mm curved bars. 6mm belly bars for use as replacement bars for uv belly bars etc., these are the bars that we use on our 6mm belly bars, the best quality surgical steel belly bars. If you need a 6mm long bar on your uv glow or brightly coloured acrylic belly bars then you can easily change the bars on all of our uv belly bars to the size you need, just unscrew the old bar and screw on the new one, (don't over tighten the balls)..
You get 6 bars in this pack. 8mm belly bars, curved high grade 316L surgical steel bars for 8mm belly piercings. 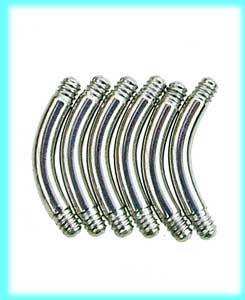 8mm belly bars, pack of 6 replacement bars for uv glow and acrylic belly bars, these 8mm curved surgical steel belly bars are the best quality surgical steel bars, the same as we use for all of our 8mm surgical steel belly bars. If you need your belly bars 8mm long, then you can esily change the bars on our UV glow and brightly coloured acrylic belly bars. Just unscrew the old bar and screw on the new one (don't over tighten the balls). 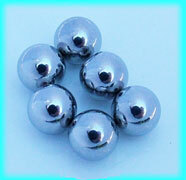 10mm belly bars for replacement on uv belly bars etc. 10mm belly bars in a pack of 6, these are the most popular size, most of our belly bars are available with 10mm long bars, if you want to make up your own 10mm belly bar then these are the best quality 10mm surgical steel belly bars. To change the bar on one of our UV or acrylic belly bars, just unscrew the ball and screw on the new bar, (don't over tighten it). 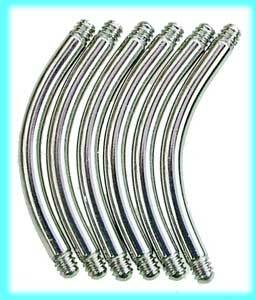 12mm belly bars, pack of 6 replacement surgical steel curved belly bars. 12mm belly bars are quite hard to come by in uv glow and acrylic belly bars, but with this pack of 6 12mm long bars you can easily change the bar lengths of our our range of uv glow and acrylic belly bars to a bar that fits you better. 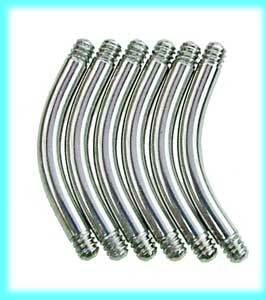 These are the best quality 12mm bars that we use as on all of our 12mm surgical steel belly bars. All you have to do is unscrew the old balls and screw them onto the new 12mm long bars. You can do this with all of our UV and acrylic belly bars, (don't over tighten the balls). 14mm belly bars, surgical steel curved belly bars. 14mm belly bars are not widely available , but we stock these 14mm surgical steel belly bars for use on our range of uv glow and acrylic belly bars, so if you need a 14mm long belly bar but find it hard to get one, this handy pack of 6 curved 14mm belly bars will help you out. 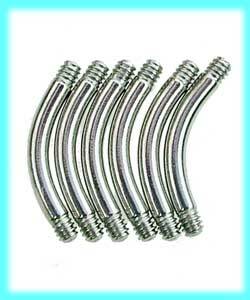 All you have to do is unscrew the balls from your existing bar, and screw them onto one of these 14mm belly bars. You can't usually do this easily on silver designs, but you can on all of our UV & acrylic belly bars. (Don't over tighten the balls). Surgical steel screw on balls to fit 1.6mm body jewellery. 6mm jewelled balls with 1.6mm thread (the same as belly jewellery and tongue jewellery), these are slightly larger than the normal top balls most belly bars are supplied with, and are available with lots of different coloured jewels. We currently have Clear, AB, Bright Blue, Sapphire Blue, Black, Pink, Cerise Pink, Red, Light Green and Black. How often do you lose your top ball from your belly bars? 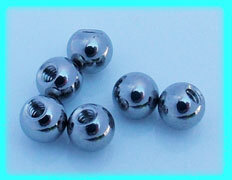 This set of 6 surgical steel top balls which fit any of the belly bars or tongue bars we sell, they have a 1.6mm thread(standard belly & tongue bar size, and are 5mm across), these will fit all 1.6mm body jewellery(belly bars, tongue bars etc.,) with threaded balls. Screw on balls to fit 1.6mm thick body jewellery. High grade 316L surgical steel screw on balls(4mm). These have a 1.6mm thread (the same as belly bars and tongue bars). Packet of 6 screw on balls. Body jewellery add ons, spare belly bar balls etc.